December 5(Wed.) through 7(Fri.), 10:00a.m. – 5:00p.m. Every equipment, system and media related to image engineering. Please fill in a separately provided application form and apply to the secretariat. Please transfer the exhibition fee to the following bank accounts by September 28. Bank fees are of your account. We will explain the details and send materials for exhibition to an applicant late October. For the electric power(wiring,earthing,others), and availability of the booth table,we will send documents separately. An installation expense for the temporary telephone is JPY 60,000 +TAX for an optical fiber. It will be billed together with a telephone charge(ex optical fiber) after the exhibition. If the exhibitor cancels the participation due to their own reason, the exhibition fee will not be refunded.For the cancelation made 60 days prior to the exhibition commencing date, 50% of the fee will be charged.After 60days, 100% of the fee will be charged. The exhibits shall be carried-in on Dec. 4(Tue.) and carried-out on Dec. 7(Fri.). If the exhibitor will decorate their booth by themselves, it is able to moving in at 15:00 on Dec. 3(Mon.). We will set up the exhibition zones including element technology and applied technology under the respective themes. If you want to exhibit your product in these zones, check-mark the appropriate zone in a separate application form to apply. Only the table-top booth can be selected for the medical zone. We set up a special display section gathering products from five categories, “Security”, “3D”, “Infrastructure Improvement” , “ITS(Intelligent Transport Systems)” and “Deep Learning” which are deemed to be the most attractive categories of the image field. It is the best place for the participating companies to advertise their products. A simple table-top display method enables to focus on the product itself. It is more specious than the table-top booth and enables a large-scaled demonstration. 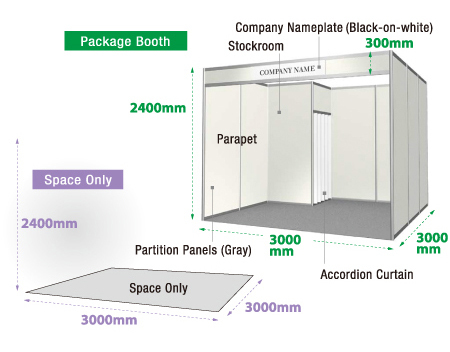 Depth is double length(1800mm) of normal booth. 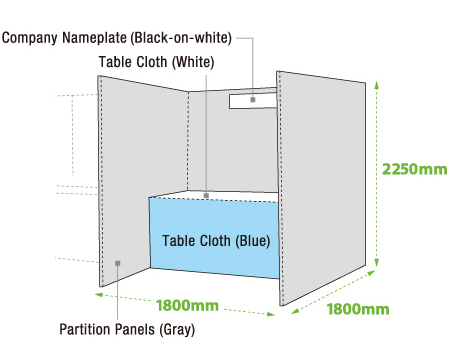 This table-top display includes a table[1,800(W)×900(D)×740(H)mm], tablecloths(White & Blue), back & side panels, company nameplate with general font(one plate per booth) ,which will be provided by the secretariat. The table is removable if unnecessary. 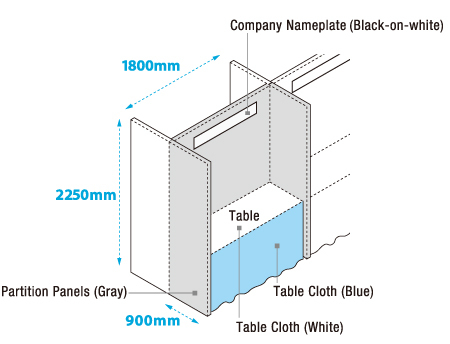 The company nameplate with specified LOGOs can be ordered separately. (Charged) Free to decorate own booth(s). Example of Exhibition※The under-mentioned display includes the expenses to exhibition fee.